Get your free copy of The Business Booster Today 2018 N5 Edition! Sign up to get this edition of our magazine for FREE! Signing up is free! We will only share your contact details with the sponsor for delivery ... after your consent of course! !! DON'T MISS OUT ON THIS FREE GOODY !! Take action to succeed in business & life! 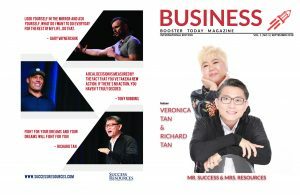 The Business Booster Today Magazine will provide you this edition for free ! Sign up to get your Free copy, NOW!